"Over the last twenty years (and to my complete amazement) I have compiled nine local history books - but I firmly believe that without the support of Margaret Forster over those years, the total would have been closer to zero." "She was the best friend I never met and I am so grateful to her for all of the help and encouragement she gave me. I would dearly like to share the memories of my correspondence with her so that more people would know how kind she was." When Mary Scott-Parker compiled her book on Carlisle High School in 1993 the novelist Margaret Forster said she'd be glad to help. "I adored the High School, " she wrote to Mary, "couldn't bear 4 o'clock or the holidays. . . . I loved everything about the school - the very building, the lovely grounds, the uniform everyone else hated." Margaret Forster had a deep attachment to the city of her birth and childhood. She always thought of herself as a Carlisle person. "Carlisle folk are outspoken, direct, impervious to flattery, don't much care what others think . . . Carlisle folk are often brusque, lacking in grace, proud of their independence, their we-don't need-anyone approach. There is a fierce pride about them which can annoy others." Margaret would have been the first person to agree that she shared these characteristics. As a child she remembered going to the old Lanes in the years long before they became today's shopping centre. "They were claustrophobic, run-down and not well-lit and I imagined all kinds of scary people lurking inside the battered doors." At eighteen she recalled catching a train to take her away from the city, to be an au pair girl in France. It was thrilling for the girl from Raffles to be leaving the city and going to a foreign country. But when she returned, she felt a surge of affection for the place: "Its smallness, its 'nothing-changes' feeling, its familiarity. Suddenly, these were attractive." She remembered her father taking her for walks when she was a very small girl, walking alongside "the wall of the Chance's estate, a place of grandeur which we saw in all its glory once a year when there was a fete there". They walked along Shady Grove Road to Heysham Park "and to St Barnabas Church, which seemed to me a gleaming white palace set among dreary concrete houses". In later years, she recalled her father showing her own children round Silloth: "They were London kids and to them it was a weird place, so empty and old-fashioned . . . but the putting green was still there for them and they loved the little roundabout outside the amusement arcade." She felt that Silloth remained "in a virtual time-warp". In her own childhood, the word Silloth had spelt excitement. The rush to catch the train, the hoot as it arrived and the doors being flung open as they rushed down to the beach, finding a sandy spot, spreading their raincoats and stripping off to the swimming costumes they were wearing beneath their clothes and then "into the sea. Cold? Freezing, always. But it was sea, so we expected it to be cold, never having heard of certain turquoise seas which were not." This is a short book, a book of memories. There are, of course, the various contributions Margaret made to Mary's books, and there are the gracious letters which Margaret wrote . Mary calls her "the best friend I never met". And the manuscript letters are reproduced showing Margaret's neat, but characterful handwriting. She always wrote, whether it was a personal note or one of her many novels, in ink on blank paper using a Waterman fountain pen. 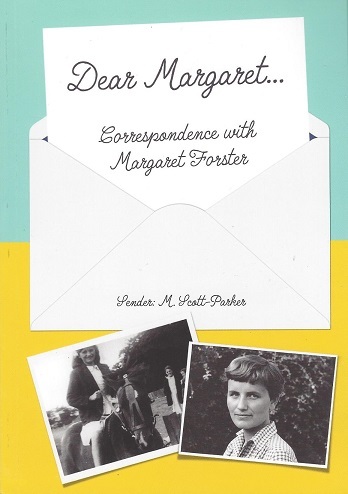 And there are letters from three of Margaret's school friends, Doreen Mallinson, Margaret Crosthwaite and Lorna Foster who had remained in regular correspondence with Margaret throughout the years. And there is a touching note from Hunter Davies, who writes that, "After 55 years of marriage, she is still in my mind every day, so there is no rush." The book is an attractive, gentle tribute to Carlisle's finest writer.